Quench clients' thirst for great tunes with this 13 oz. 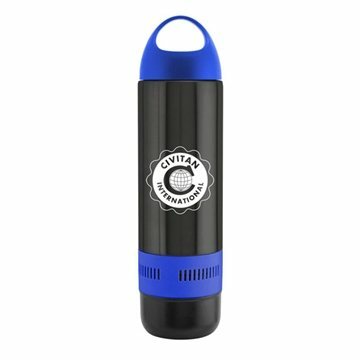 Bluetooth water bottle! The multi-function device is both a vacuum bottle and wireless speaker. The 400 ml double wall bottle has a 304 stainless steel interior and a 201 stainless steel exterior. It comes with an ABS and silicone color accent panel speaker band and is hand wash only. Do not microwave or place in the freezer. The BPA free item is designed for use with both hot and cold beverages. It must be charged prior to the first use, with charging time varying by device. A charging cable and instructions are included and it's FCC approved.